The mandates governing FDA-regulated products are complex and constantly changing and the consequences of a misstep can be costly. Inspections, Warning Letters, consent decrees, criminal investigations… All can disrupt your business, taking a huge toll on the bottom line and damaging your company’s reputation. For decades we’ve helped professionals like you confront the most pressing compliance challenges, with expert guidance and insight that can help you navigate critical regulatory requirements and avoid enforcement actions. Choose from any of the subscriptions below to keep up with the shifting requirements, recommendations and expectations of the FDA and the other government agencies that regulate your products, your business and your personnel. 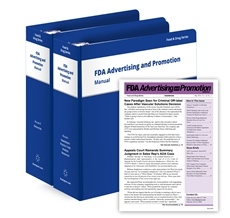 FDA Advertising and Promotion Manual Avoid missteps surrounding federal advertising and promotion requirements for drugs, medical devices, biological products, foods and veterinary products. FDA Enforcement Manual Protect yourself and your company when dealing with wide-ranging FDA enforcement measures. 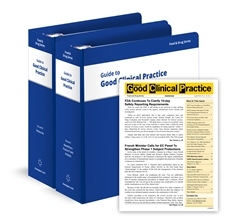 Guide to Good Clinical Practice Your one-stop resource for clinical trial regulations, guidelines and best practices. Guide to Medical Device Regulation Speed your new device to market and ensure that you understand your postmarket obligations. 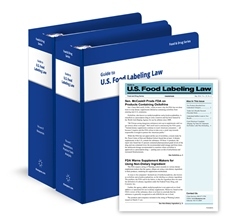 Guide to U.S. Food Labeling Law Avoid recalls and other costly and embarrassing enforcement actions. FDA Compliance Expert Suite Authoritative information about compliance with the FDA's requirements in the areas of enforcement, medical devices, advertising and promotion and clinical trials.